Today, we are going to start a new 3-part series of tutorials on shape detection and analysis. Compute the center of a contour/shape region. Recognize various shapes, such as circles, squares, rectangles, triangles, and pentagons using only contour properties. Label the color of a shape. “How do I compute the center of a contour using Python and OpenCV? In today’s post, I’ll answer that question. And in later posts in this series, we’ll build upon our knowledge of contours to recognize shapes in images. Figure 1: An example image containing a set of shapes that we are going to compute the center of the contour for. 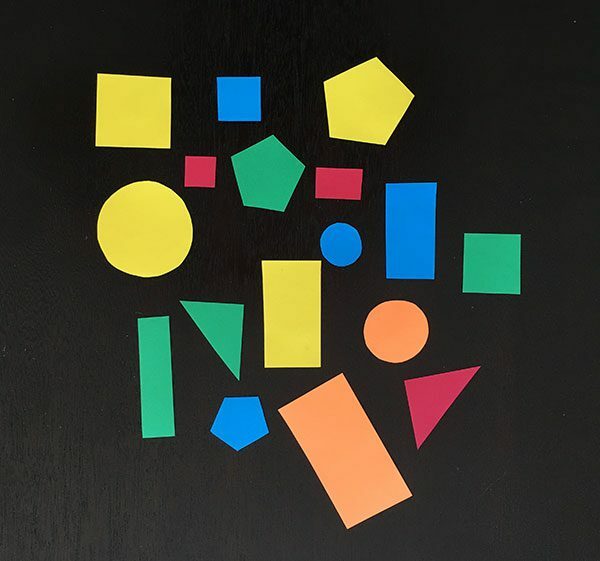 In above image, you can see a variety of shapes cut out from pieces of construction paper. Notice how these shapes are not perfect. The rectangles aren’t quite rectangular — and the circles are not entirely circular either. These are human drawn and human cut out shapes, implying there is variation in each shape type. With this in mind, the goal of today’s tutorial is to (1) detect the outline of each shape in the image, followed by (2) computing the center of the contour — also called the centroid of the region. Blurring to reduce high frequency noise to make our contour detection process more accurate. Binarization of the image. Typically edge detection and thresholding are used for this process. In this post, we’ll be applying thresholding. From there, we can go ahead and get started. We start off on Lines 2-4 by importing our necessary packages, followed by parsing our command line arguments. We only need a single switch here, --image , which is the path to where the image we want to process resides on disk. We then take this image, load it from disk, and pre-process it by applying grayscale conversion, Gaussian smoothing using a 5 x 5 kernel, and finally thresholding (Lines 14-17). Figure 2: Thresholding our image returns a binary image, where the shapes appear as white on a black foreground. 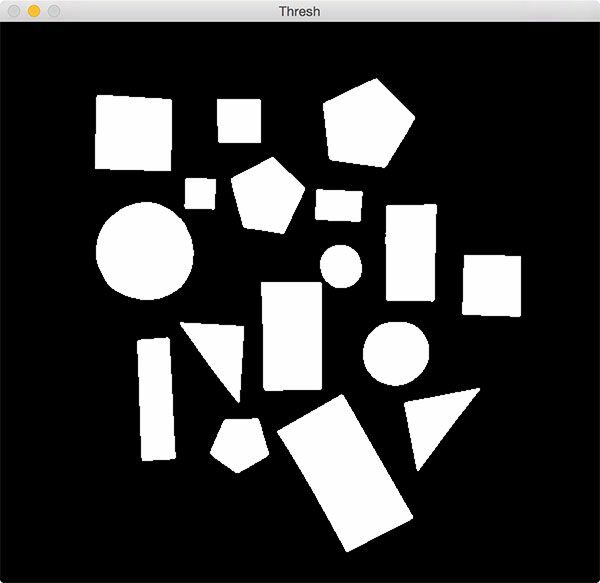 Notice how after applying thresholding the shapes are represented as a white foreground on a black background. A call to cv2.findContours on Lines 20 and 21 returns the set of outlines (i.e., contours) that correspond to each of the white blobs on the image. Line 22 then grabs the appropriate tuple value based on whether we are using OpenCV 2.4, 3, or 4. You can read more about how the return signature of cv2.findContours changed between OpenCV versions in this post. On Line 25 we start looping over each of the individual contours, followed by computing image moments for the contour region on Line 27. In computer vision and image processing, image moments are often used to characterize the shape of an object in an image. These moments capture basic statistical properties of the shape, including the area of the object, the centroid (i.e., the center (x, y)-coordinates of the object), orientation, along with other desirable properties. Here we are only interested in the center of the contour, which we compute on Lines 28 and 29. Drawing the outline of the contour surrounding the current shape by making a call to cv2.drawContours . Placing a white circle at the center (cX, cY) -coordinates of the shape. Writing the text center near the white circle. Figure 3: Looping over each of the shapes individually and then computing the center (x, y)-coordinates for each shape. Notice how each of the shapes are successfully detected, followed by the center of the contour being computed and drawn on the image. 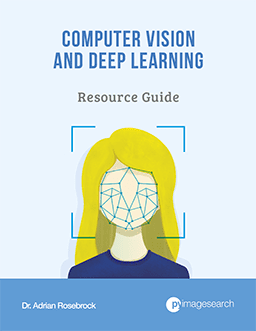 In this lesson, we learned how to compute the center of a contour using OpenCV and Python. This post is the first in a three part series on shape analysis. In next week’s post, we’ll learn how to identify shapes in an image. Then, two weeks from now, we’ll learn how to analyze the color of each shape and label the shape with a specific color (i.e., “red”, “green”, “blue”, etc.). To be notified when these posts go live, be sure to enter your email address using the form below! Great job. I’m looking forward to completing this series of posts. Thanks for sharing your knowledge with the world!!! Hi Adrian, another great Tutorial, but how to run the script into the Python Idle directly? You would have to copy and paste each command into IDLE one-by-one. If you like using IDLE, you should also look into using IPython Notebooks as they are a bit more user friendly. There seems to be good support for opencv for shapes and finding centroids but are there equivalent routines for line detection. I have found this to be quite challenging especially discriminating between lots of small noise lines and what I think should be dominant significant lines. Line detection is much, much more challenging for a variety of reasons. The “standard” method to perform line detection is to use the Hough Lines transform. But for noisy images, you’ll often get mixed results. I got “ZeroDivisionError: float division by zero”, because all “m” values are 0. Why? Where I wrong? I trying solve it but do not have luck. 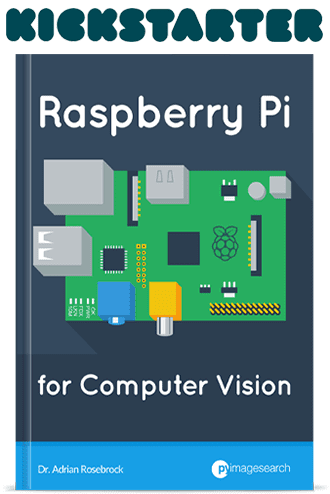 I use Python 2.7 and openCV 3.1. Where you can set MIN_THRESH to be a suitable value to filter out small contour regions. Hi Adrian, where should i put this command? And what is the range of the MIN_THRESH? You would typically define MIN_THRESH at the top of your file, but you can place it anywhere that you think is good from a code organization perspective. The actual range of MIN_THRESH will vary on your application and will have to be experimentally determined. Just run to a minor glitch in the example as I was getting zeros on the M = cv2.moments(c) on the first iteration, leading to float division by zero. A simple work around was to implement a check for 0.0 results. Cheers for awesome tutorials anyway. Could you please explain a bit more why on the pre-processing stage you slightly blur the image??? Blurring (also called “smoothing”) is used to smooth high frequency noise in the image. Simply put, this allows us to ignore the details in the image and focus on what matters — the shapes. So by blurring, we smooth over less interesting regions of the image, allowing the thresholding and contour extraction phase to be more accurate. 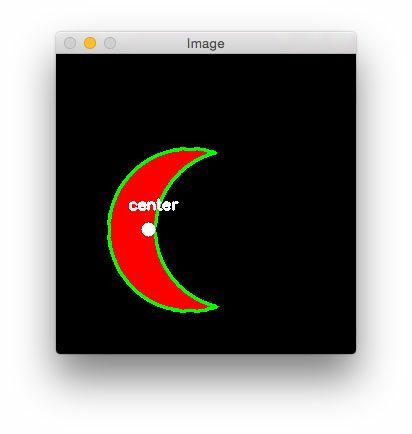 It may be a little off topic, but I’m curious how the tool to find the center would fair against crescent-shaped features. Would the centroid be inside the shape, or in the middle possibly blank area? Great question. It would still be inside the shape, in the center, but towards the rim. An example can be found here. Keep in mind that only non-zero pixels are included in the calculation of the centroid. which means that cX and cY is outside of range of the image size. Therefore, I want to ask how can i find out the pixel coordinate at point (cX, cY)? Thanks for a great tutorial Adrian. Could you please explain here or in another tutorial how to use image moments to characterize the other shape and statistical properties of an object? In fact, I have already done that! Please take a look at this series of blog posts on Zernike Moments to characterize the shape of an object. I also demonstrate how to do this inside the PyImageSearch Gurus course. What i simply did was that i just downloaded the code and ran it and the above error occured. Also could you suggest me a book which i can use to learn open CV with python from scratch. I know python but i don’t have any clue about open CV. 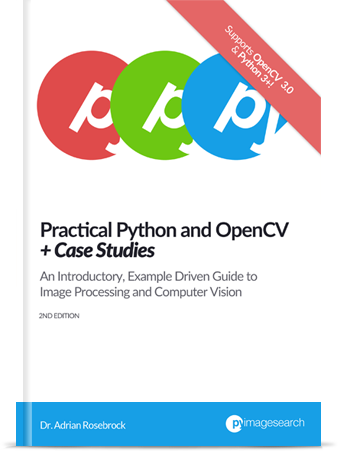 If you want to learn OpenCV + Python from scratch, I would highly recommend that you take a look at my book, Practical Python and OpenCV. Thank you for your reply. i shall definitely refer that book. Could you please elaborate i still am not able to figure out what i have to do. Where do i have to make changes in the code. Just wanted to add that i’m running the exact same code on IDLE and tis is what it shows as error. Do i have to run it on CMD as admin? thanks Adrian! I do not use to leave comments. But you saved me! Pleasure to read you again! I’ve tried placing: plt.imshow(image) inside of the for loop as I thought this would work. It will run the cell with no error but not display any image. From there, follow this tutorial on displaying images with matplotlib. You can use this code to detect shapes in real-time as well. You should use this post as a starting point to access your webcam. The cv2.findContours function in OpenCV 2.4 returns a 2-tuple while in OpenCV 3 it returns a 3-tuple. You can read more about the change in this blog post. I need to find radius of the given x,y coordinates of the center of a detected region? How can find the radius of each detected image? I would suggest computing the cv2.minEnclosingCircle of the contour region to obtain the radius. Suppose three boxes are kept on top of one another. Does this method apply to finding the individual centres of each box, or it will find the single centre for the entire image? You would want to change the cv2.findContours function call to either return a list of contours or a hierarchy, otherwise the script would find the center of the largest outer rectangle. In particular, take a look at the cv2.RETR_LIST flag. I tried to run this code on my system. But if I keep the code just the way it is, it shows me lots of centres (probably because it is in the loop). But when I keep that lines 33-39 outside the loop, there comes only one circle named centre but that is not on the center point but is somewhere at the bottom left corner of the contour. Can you please help me out with this? Hi Ambika — this code will draw the center of each shape on Line 33. It does this by looping over all contours that have been detected. If you move Line 33 outside of the for loop then the coordinates will be incorrect. What exactly are you trying to accomplish? 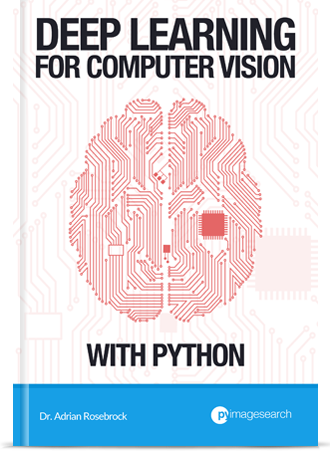 For your kind information, I am using OpenCV 2.4.9 and Python 2.7. You need to click on the active window and press any key on your keyboard to advance the execution of the script. That is what the cv2.waitKey call does. Also, if I wanted to add the additional functionality of counting the number of shapes/objects in the image, what would be the best way to go about this? You need to be more specific regarding counting the number of shapes/objects. What is your end goal? Are there multiple objects of the same shape? Or are you looking just to get the total number of objects in an image? In that case, simply apply cv2.findContours. The number of contours returned will be the total number of objects in the image. You might have to filter the contours based on width/height/aspect ratio to help protect against false-positive detections, but that’s basically the gist. Very nice,good to read and made easy to understand. But am I correct in assuming that if my basic image has a white background instead of your example black background, the contouring doesn’t work? Why not just flip the image via cv2.bitwise_not that way your white background becomes black? Can i find the largest contour area from many contours in a frame from a video. If there are 3 circles: left, middle and right, if left is having more area than other 2.i want to tell its left circle,is it possible? I would suggest sorting your contours and maintaining a list of (x, y)-coordinates for each ball. A dequeue data structure like in this post would be really helpful. From there, monitor the (x, y)-coordinates in the dequeue. If there is a lot of variation, you know the ball is moving. Hi! We are developing a mobile application that aims to measure an object’s area, to identify the real object’s (poultry eggs) size. We are about to use the formula for ellipse to get the area of the object, and the centroid to identify the axes needed. However, we are not sure if there is an available code in java for this. Thank you! Hey Markus — I only provide Python + OpenCV code here. You would need to port the code to Java yourself. i’m running the code and i get this error, could you please help?! i don’t know where i’m going wrong. It sounds like the color threshold parameters need to be tuned a bit. Perhaps your environment has a bit of a “green tint” to it. You would need to define a color threshold range for each color you wished to detect. Hey Jason — the issue is that you are not correctly providing the command line arguments to the script. Please take a look at this post for more details. Hi, I am trying to find centroid for moving object in that I am facing difficulty. Can any one please help me in that ?? What object are you trying to compute the centroid of? Without seeing it’s example it’s hard to point you in the right direction. How can i get centroid(rectangle)-centroid(circle) value in this code. Your help may be appreciated. See this blog post on shape detection. Once you know the name of the shape you can compute the centroid for each and subtract. Hi..I want to ask why I use a picture whose background is white and this code didn’t work. Dose it relate to the color of background? The code assumes that white is foreground and black is background. 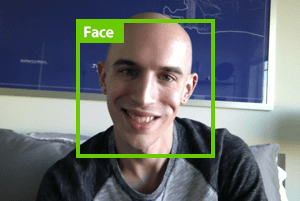 You may want to invert your image with a “cv2.bitwise_not”. https://learn.letskodeit.com/p/practice. it’s background is white, hence I added cv2.bitwise_not to your code. The problem I still face though is that, even if the code captures most of the objects (shapes) it does also capture shapes that are purely words next to each other. For example the radio button labeled “BMW” is considered as a rectangle. There are a few ways to approach the problem but I would suggest inspecting the gradient magnitude representation of the image like I do in this tutorial. You can use that representation to filter out text vs. other elements. how do I change it so that it doesn’t error? Or you can click the active window opened by OpenCV and then hit any key on your keyboard to advance the execution of the script. How can I find width and height of specific shape? Make sure you read this tutorial. Great job! How can I find height and width of each elements or for one of them? Hi adrian, thanks a million for making this post. saved me a ton of work!!! Thanks Sebastian, you are more than welcome. Thank you very much, it was really useful!!! Thanks Dan, I’m glad you enjoyed it! Sorry! i got it. but i get this error! python: can’t open file ‘center_of_shape.py’: [Errno 2] No such file or directory. We are using Spyder, launched through anaconda navigator. I would recommend executing the script via the command line instead.